“Just delegate it to someone on your team,” your well-meaning, but unhelpful, colleague advises you. If only it were that easy! Delegation is difficult because it’s a process, not an event. 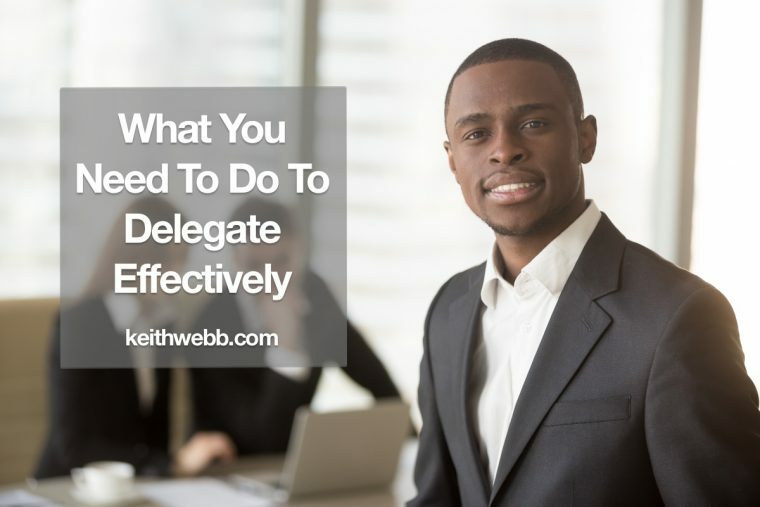 Here’s what you need to do to effectively delegate and get the results you’re looking for. Delegation is a an essential leadership skill. Each stage of your leadership growth requires a different level of delegation. Each level brings new challenges and is progressively more difficult. Simple leadership is for you to delegate tasks, but manage the larger project. You’re still hands-on and in control of the overall project. For your organization to grow, however, you need to stop managing projects and delegate them instead. This level of delegation requires more skills than many leaders practice. Beyond projects is delegating strategies. You’ll never get here unless you’ve mastered the first two levels. What tasks, projects, or strategies need to be delegated? Delegation is difficult because it’s a process, not an event. I hear control mentioned as a barrier to delegation. Control is certainly a factor. But I’ve found more basic reasons keeping leaders from successfully delegating. Delegation takes work! 1. Organize your part. My lack of organization, rather than the usual culprit – control, more often keeps me from delegating successfully. There’s a part of the task I must decide or do. I must tie up some threads that first require my planning, or deep thinking, or a decision in order to hand it to someone else. For several years now, I’ve been much too involved in the details of publishing our organization’s monthly email. The reason, I’ve come to realize, isn’t that our “office staff” aren’t capable, it’s that I wasn’t organized enough. I waited until the last minute to write the short message that goes at the top of each newsletter. This meant that I would do the final steps of publishing the newsletters myself, which wasn’t always convenient as I travel. Once I got organized and wrote the articles on a schedule a week ahead of time, others could easily complete and send the newsletters without me doing anything but writing the article. How do you need to organize your part to be able to delegate the rest? 2. Clarify what you want. If you aren’t clear on what you want, it’s a pretty slim chance someone else’s work will satisfy you. The level of detail can vary. You can delegate detailed tasks, like, “Book my hotel at the same location as the national conference,” or projects with general parameters, as in, “Revise our new employee orientation to be more interactive.” You have to be clear on what you want and clearly communicate that. You also need to be clear on the timing, budget, and authority. For example, what parts of the project can they decide and what must they get your approval for? What budget do they have? By when does it need to be completed? If you aren’t clear, the person you ask to do it will either come back and ask you or do it differently than you want. What exactly do you want done? My lack of organization, rather than need for control, kept me from delegating successfully. 3. Create milestones for reporting. Don’t be all-or-nothing in your delegation. Create milestones for the person to report their progress along the way. It’s not just for you. People want to know that they are doing what you’re looking for. Use the power of small wins to encourage their progress and give a pat on the back. It’s better to suggest a correction mid-course than to ask for changes after the work has been fully completed. What check-ins along the way would be helpful – to you and the person doing the work? 4. Be available to coach during the process. I disappear for days at a time when I travel and lead workshops. What’s helpful for successful delegation is to be in touch during the process. I meet together virtually with our Administrators most Monday mornings. They can also contact me anytime using Slack. Contacting me isn’t a sign that they can’t do it. When, for expediency, we take back the task, we disempower the person and show poor leadership. Instead, use it as an opportunity for to support their work and develop them further through coaching. Be available during the process for clarification and coaching when needed. What support will you offer during the process? The more you do these 4 steps, the more the people you delegate to will grow in their ability to do what you need done. Be aware, however, that the opposite is also true: if you don’t do these 4 steps the people you delegate to will not be able to deliver the results you want. You have to do your part if you will delegate effectively.